Safe drinking water has become a centerpiece of San Diego Unified’s pitch for a new $3.5 billion school bond on the November ballot. A majority of the 11 schools flagged in 2017 and 2018 for dangerous lead levels were explicitly promised new or improved plumbing twice in the last decade under previous bonds, but haven’t yet received it. A majority of the 11 San Diego Unified schools flagged in 2017 and 2018 for unsafe levels of lead in the water were explicitly promised new or improved plumbing twice in the last decade under previous local facility bond tax measures, but haven’t yet received it, district records show. Safe drinking water has become a centerpiece of the pitch for a new $3.5 billion school facility bond by San Diego Unified School District officials, who say the new tax money would ensure old pipes and lead solders contaminating water with lead would be fixed or removed. District staff and elected school board trustees have repeatedly cited the Flint, Michigan, water crisis and the results of their own tests to support the new bond, which would raise taxes by 6 cents for every $100 of assessed home value, or $300 for a $500,000 home, for 39 years if approved by 55 percent of voters in November. San Diego Unified is in the midst of a multiyear plan to test about 7,200 water outlets districtwide for lead with the goal of seeing all results below 5 parts per billion, consistent with the U.S. Food and Drug Administration limit for bottled water. The lead action level established by the state and federal government is 15 parts per billion. Voice of San Diego examined bond project lists in the ballots for Proposition S, a $2.1 billion school facility bond measure passed in 2008, and Proposition Z, a $2.8 billion bond measure passed in 2012, and compared them to district reports of completed bond projects and water testing results above the state and federal action level. Those schools are: Bird Rock Elementary, Birney Elementary, Cabrillo Elementary, Webster Elementary, Wegeforth Elementary, as well as Emerson-Bandini Elementary. Another school flagged for high lead, San Diego Cooperative Charter School 2, now shares the Emerson campus, but didn’t appear specifically in past ballots because it wasn’t yet open. Another two schools — Encanto Elementary and Hoover High — received some new bond-funded plumbing when new buildings were constructed or old buildings were renovated, but old plumbing remains elsewhere on campus. After Voice of San Diego highlighted the similarities between the projects in the new bond and the old bond measures last month, and the continued need for new plumbing at Emerson-Bandini Elementary, district officials said the public should know new plumbing is coming to Emerson’s campus as part of an upcoming large-scale modernization project. Construction is scheduled to begin in December and continue through June 2020, according to the district’s construction project webpage. San Diego Unified spokeswoman Maureen Magee said plumbing work will proceed bit by bit as each building is demolished and rebuilt. The first building with new plumbing is expected to be open next winter, she said. The project design is still awaiting state approval before the work will be bid and construction begins. But the district’s assurance that it will begin replacing the plumbing at Emerson soon begs the question: Why does the district say in its new bond pitch that it will replace plumbing at Emerson if it already plans to do so using existing bond funds? Magee said the 2018 bond could pay for more extensive renovations. “Propositions S and Z provided for the replacement of old pipes and plumbing fixtures, because those materials were nearing the end of their useful lives, and they were decaying. Should voters approve The Neighborhood School Safety and Repair (2018) bond, more extensive renovations would include: replacement of all plumbing fixtures manufactured with higher lead concentrations, which would allow the district to make the investments necessary to meet the new clean water standards established by the Board of Education; the installation of water bottle filling stations, among other improvements,” she wrote in an email. 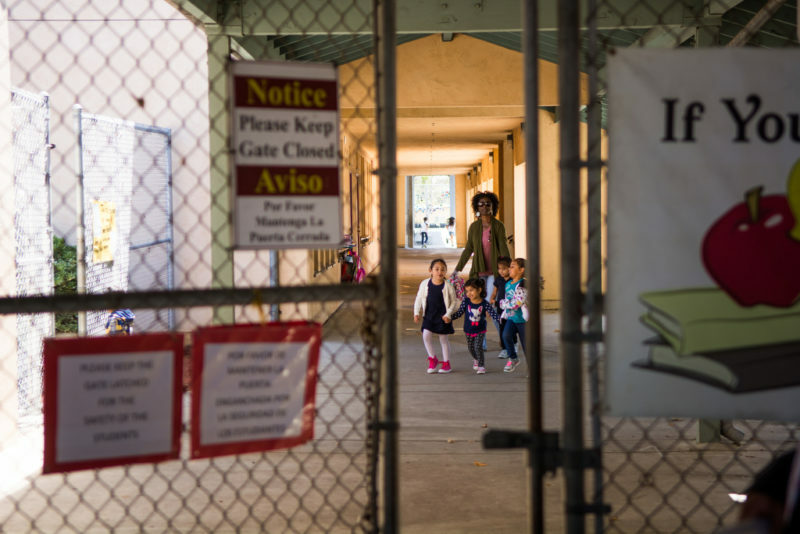 The two remaining schools cited for lead above state and federal limits in recent years, Mann Middle School and the Montezuma Child Development Center, were not expressly promised plumbing fixes in Props. S and Z, though the 2018 bond does include plumbing for Mann Middle. Two separate district administrative offices flagged for lead levels above state and federal limits in recent years were not promised plumbing previously, records show. District bond documents show the San Diego Unified still has $2.1 billion left for Props. S and Z, though officials have already planned how to spend that money through 2031 and say more is needed.